Henry Roosevelt Farmer was born on May 25,1925 in Tarboro, NC to the Late Thomas and Annie Farmer. He was the fifth of eight children. Henry was raised in a caring and loving family. He was educated in the Tarboro Public School System. He went on to serve his country in the United States Army, having an active tour of duty in Tinian and Saipan, South Pacific with an Honorable Discharge in January 1946. He began his Christian journey at St. Paul A.M.E. Zion Church in Tarboro, NC. His spiritual membership continued in Baltimore MD at Holy Bibleway Baptist Church under the pastorship of Rev. Thomas R. Scott and finally at the Garden of Prayer Christian Church under the pastor ships of Rev. George A. Hurt, Apostle Melvin B. Tuggle II and Rev. Dr. Brenda M. Tuggle where his strong spiritual and personal relations continued to be a long-lived journey. Henry was a member of the Male Chorus and on the Trustee Board, having served as Trustee Chairman. He loved being in attendance at church services, enjoying the spoken word, the music provided by his son, Kenneth, his granddaughter’s singing, and being embraced by the outpouring of fellowship from his beloved church family. 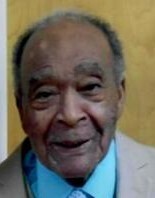 Henry’s span of employment years included Walgreen’s, Fisher Body & Fender, Glenn L. Martin Aircraft Co. (American-Marietta Corp.), Western Maryland Railroad, Brawley Shell Co., and the Prince George County School System as a Building Superintendent. He was a dedicated worker! He was also an active member of the Prince Hall Masons. His special interests and fun times included motor cycling, disc jockeying, and buying luxury cars. Henry was truly a man of statue when dressed in his fashionable attire. He loved attending family gatherings, being in lively modes and of late in quieter ones. Henry married Bernice Hannah in 1947 and to this union were born two sons, Harold. and Henry, Jr.. He also fathered two additional children, son, James Earl and daughter Ceciley . On February 10. 1953, Henry married Ruth A. Jones and this union was blessed with sons, James, and Kenneth, and daughter Patricia. Their first meeting happened when Henry’s mother took him to her friend’s home to see her new baby, and he stood tip-toed over the crib to see this little girl who was “Ruth”. It was a divine beginning! His special times with family, neighbors, and friends included barbecuing and fish frying in the backyard, sitting around, enjoying the delicious foods while sharing love and laughter. During their 65 years of marriage, their gift of joy and happiness was in spending endless time together. Enjoying their gift of gab was not to be missed. In addition to his loving wife and children, Henry had two in-house supportive and loving caregivers, Delores Jennings, and granddaughter, Kenya Griffin. He loved and took delight in his family while also embracing their love and care. Henry accepted the Master’s call at home on Thursday, November 29. 2018 at the age of 93. We are deeply saddened by his departure. He was preceded in death by his siblings: Daisy Lee, Thomas, Ruth, Annie, William, Milton and Alma, and his sons, Henry, Jr. and James Earl. He leaves to cherish his love and memory, his devoted wife, Ruth A., daughters Patricia V. Griffin and Ceciley B. Sanders; sons, James A. Jones, Harold V. Farmer and Kenneth I. Farmer, 18 grandchildren, and a host of great-grandchildren, daughters-in-law, Jacqueline Farmer and Sarah Farmer, sister-in-law, Elizabeth Farmer, God son, Brian Brown, and a host of nieces, nephews, cousins, neighbors, church family and friends. Gone, But Not Forgotten!